Do you want to see your glass surfaces shining without spending time, effort and much money? You can make this real now – just let the specialists of window cleaning in Lambeth take care of this task for you. We guarantee that all parts of your windows are in pristine state – glass surfaces, framework and window ledges. You can rest assured that your property is managed with great attention time for spare necessary. assignments this is not all – the But to chance will come to you save time and efforts with together many. We also provide our professional services in nearby areas: Westminster, Tower Hill, Blackfriars, Fenchurch Street, Fleet Street. The experts of window cleaning use sophisticated strategies for the procedure of scrubbing and rinsing your glass surfaces, roof windows and greenhouses. Our water-fed extension pole feature allows us to reach as high as the fourth floor. The pole is attached to a water reservoir in the van, eliminating the risk of damage to the exterior of your property. We also use jet washing as part of our window cleaning routine. You can also take advantage of these advanced procedures. You can be sure that the good look of your commercial building is certain. The specialists will provide you with second-to-none commercial window cleaning. With the help of our water-fed extension pole tools, you will receive swift and perfect washing of all windows up to the fourth floor. For high-rise buildings, we proceed with our rope access equipment. It is our efficient method of reaching glass panes on taller buildings. Regardless of what is the size of your property – a humble corner shop or reinforced-concrete giant of London – we will ensure great look of your windows. You can rely on the team - they are truly the experts of window cleaning. They all have passed through diverse training, so you can receive top-notch service for all glass surfaces kinds. What we can polish includes: single, double, garden windows, bay or sash windows, patio doors, French doors, conservatories and skylights. Your house can become better quickly with our aid. Contact us every time you need efficient window cleaning for your house or office. 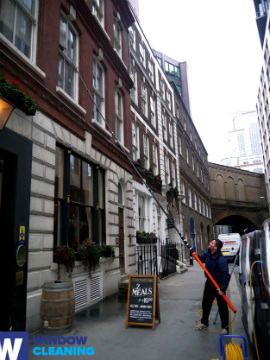 Profit from our prompt and professional domestic window cleaning in Lambeth. We can clean the windows of your property in and outside. The products we use are eco-friendly - you will have the perfect end-results and be ecologically responsible. In addition, we use only purified water. Don't wait, call 020 3746 3113 and order our top-notch services. Our customer care staff will assist you – they are active 24/7. We have other ways of booking – our request a cleaner online form or just chat with our operators. The nearest tube station serving SE1 Lambeth is Lambeth North.